By Rebecca Nickols on January 28, 2013 Visit Rebecca's Website. I’m not only crazy about my colorful, entertaining backyard flock of chickens, I’m also passionate about the native birds in my backyard. My husband and I have a small business (Rebecca’s Bird Gardens) where we sell birdhouses and bird-feeders at our local farmers’ market. Even though I all about “feeding the birds” you can actually attract twice as many birds to your landscape by creating a garden that provides their natural food sources: nuts, seeds and fruit from native trees, shrubs and wildflowers. I recently gave a presentation for the Master Gardener chapter that I’m a member of on creating a backyard habitat that will attract birds to your landscape. However, offering a variety of birdseed in an assortment of bird-feeders will give you those up-close views of the birds everyone enjoys. As a follow-up to my presentation, I’m now conducting a workshop on DIY bird-feeders–utilizing natural sources, recycled materials and re-purposed items. 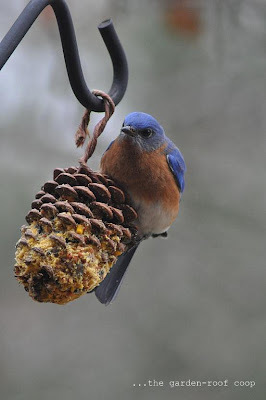 In addition to offering birdseed, suet and fruit to attract an assortment of birds to your landscape, providing a feeder filled with mealworms will entice insect-eating birds including: wrens, robins, jays, sparrows, cardinals, woodpeckers, nuthatches, titmice, chickadees and my favorite: bluebirds! Mealworms can be offered either dried or fresh, but of course – fresh is the preferred choice of the bluebirds that visit my feeders and… my backyard chickens! So… back in September I took the plunge and purchased 1000 live mealworms and began my adventure in raising these tasty treats. However, this project is taking much longer than I thought and instead of waiting until I was harvesting my own “homegrown” worms, I thought I would share with our readers the set-up, steps and progress of my DIY project. A plastic or glass container. I happened to have a 10 gallon aquarium with a screen cover (left over from some former critter-pet of one of my daughters). As the chicken keeper suggested in the tutorial, you want a slick or smooth sided container that the worms can’t climb up and the lid should not restrict the airflow. Food to feed the larva. Vegetable scraps such as carrots or potatoes. Fruit can also be given, but I found that it attracted fruit flies; so I advise not to feed them fruit… Never offer water, they receive moisture from the vegetable mater. If you do have a kitchen scrap with a large water content (such as a tomato) elevate it on a plastic container lid to keep the water off of the bedding. Only feed them what they can consume in a short time and remove any uneaten food.–It’s crazy how much they eat! The Mealworms (I purchased mine from Wild Birds Unlimited; 1000 for $15.00). Add the mealworms to your prepared container. The larva and beetles need a temperature above 55°F–so at this time of the year they’re living in my house… I did have them in the mudroom, but my daughters stated that they didn’t want to explain my latest endeavor to visiting friends.–Understandable; I moved them to my bedroom (ugh). 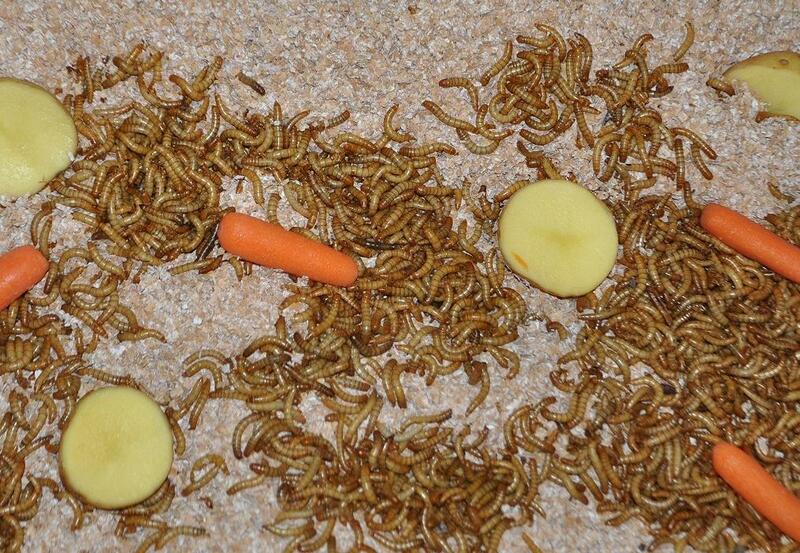 Feed the worms (carrots, potatoes, sweet potatoes, eggplant, broccoli, etc.). I have probably 1000 of the healthiest beetles you’ve ever seen, but still not a single mealworm. The entire life cycle and metamorphosis requires patience – so, I’ll wait. And I’ll update this post when I have a bountiful harvest of mealworms to offer the wild birds and my beautiful hens! *All treats should be offered sparingly; all things in moderation… Too much of a good thing is just that: “too much”. Also, there have been some studies that link asthma related illnesses to mealworm exposure. As a nurse I’m not too worried though, there are studies that link illnesses to just about anything, but if you are raising mealworms on a large scale I would definitely take precautions (wear a mask, practice good hand-washing, keep the area clean). My name is Kristin from Natures Way we raise high quality mealworms at a reaonable price. If you would like to try our worms call us 18003182611 tell them Kristin reffered you and you will get 10% off your first order through the month of November. I just started to raise mealworms. I have them in one of the 3 drawer containers that I purchased from Wal-mart. I have rolled oats and wheatgerm in the top and bottom drawers and I have only oats in the middle because the pupa doesn’t eat. I think next time I will use chicken starter (non-Medicated) for their food. I purchased my worms from a local pet store. I have the top drawer for the worms, the middle drawer is for the pupa and the bottom drawer is for the beetles. I have a small lid in the top and bottom drawer that I put carrots or cucumbers in for thier liquid. As my worms turn into pupa I move them to the middle drawer and as my pupa turns into beetles I put them in the bottom drawer. I check them everyday and move as needed. I have not gotten to the eggs from the bottom drawer hatching yet, but as that happens I will transfer to top , Etc. and feed my chickens the mealworms as needed when I have a surplus supply. I give my beetles to my son’s Bearded Dragon-it seems to enjoy them. This takes a little time at first and once it starts morphing it seems to be fairly fast. Not a lot to do with raising only trading out fresh vegs and changing one stage to the correct drawer. When the feed starts to look like sand you are able to use this for fertilizer and start a new top drawer of food. The bottom drawer can be changed as well but suggest you save the sand because there could be live eggs in it for about 3 to 4 months to make sure they have all hatched then it can be used for fertilizer also. Sorry forgot to say I place a single sheet of newspaper over the top of the worm trays so that they can be in the dark all the time. I also pick out any black dead worms and any of their exoskeletons and any dead beetles to keep the drawers clean. I have been raising meal worms for years and leave the containers in my garage year round. I live in IN so the worms are exposed to cold temps. Have never had a problem with them. My bluebirds and chickens are spoiled. I buy mealworms at walmart in their bird seed section. The ounces is more than at TSC and the cost is a few dollars less. So, when I go to walmart I always check to see if they have them. They have been out a few times but always get them back in. Sometimes I think I am the only one that buys them. I use a gallon opaque plastic jar that I got from a sandwich shop (cole slaw came n it) corn flakes and a couple of apple slices. I raised mealy worms when I was raising exotic birds. they loved them and raising the mealy worms was not difficult. LOVE BLUEBIRDS! Would love to feed them! Would not love to raise mealworms! This may be a project I would undertake this fall. Our basement is warm enough to keep them out of the living area. My chickens are free range and are always in the compost bed digging and eating. They think everytime someone comes out it is to give them a treat of some type. Looking forward to the giveaway and so are the chickens. Great tutorial on mealworms. I may finally give it a shot. The question I have for you is, Aren’t you afraid of the diseases (MG especially) that wildbirds carry and can transmit to your chickens? A friend of mine recently had to destroy her entire flock (30+) of rare breed chickens because of MG. They did not have it before she started attracting birds to her property. That’s a great idea and i know that my chickens would love them but NOT my wife so, i’ll have to try this new DYI probably in my garage out of her site for awhile. Thanks for the instructions and setup. I have just started the experiment, will see how it goes. I love to try new things, especially when it saves me money! I think Ill try to raise some mealworms. For the challenge and for my lovely chickies! Interesting. I am a First Grade teacher and we are building habits for mealworms and studying their life cycle starting next week. Mealworms are new to me so I was looking for a little background info on them before starting them with kids. I think the kids are going to love this science project. I purchased the mealworms to start my own colony from http://www.fishcreekmealworms.com They had good prices and free shipping! not sure yet if i am ready to partake in raising my own mealworms…..but hopefully one day i will be able to try !!!! We plan on trying this out this Spring. Definitely pinning this. Thanks! I started raising redworms last summer for the compost pile,and that didn’t bother me, which is surprising because when I was much younger, I hated worms. Red wigglers are prettier than earthworms. Anyway,I would LOVE to try raising mealworms. I am working on getting more types of birds in to my yard, so will do whatever it takes,if not too expensive. My husband doesn’t appreciate these things. 😉 And when I have a bunch, I would love to treat my chickens. Curious to know what a “sugarbear/pocketpet” is in the last comment? Just wanted to say thank you! I am the winner of the mealworm treats and just received them today, on this 24°F day in February. The girls have not been out of their coop much in the past few months…too much snow and ice out there for them to wander like they usually do. That much more the reason they will be thanking you too when I bring them some of these special treats! And I really do think I am going to try to start raising my own. Thanks for the tips as well as the treats. I totally agree with separating the beetles, worms and larvae…I too use a 3 drawer plastic setup like Donna’s and it works great. I also use a smaller three drawer setup that I place on top of my larger one for the purpose of changing out the different stages. Raising mealworms is a cinch but it does take lots of patience when you’re first starting out. If you keep all the stages together you will lose a lot because they do consume each other. I use small plastic tweezers to pick out the larvae & beetles from the oats & wheatgerm although I;ve really grown accustom to handling all three stages now. The tweezers just make it easier to pick them out from the oats. I don’t use a sifter because it was just to messy. btw, I raise mealworms, not for chickens, but for my sugarbear/pocketpets. They love ’em too! A winner as chosen by a random number generator… Thanks for all your comments and continue to leave your tips and thoughts on the subject of mealworms! Congrats KatyDaly! You’re the lucky winner! Check your email! I have been buying my meal worms at lowes in the bird food section. They are cheaper than happy hen treats . They are exactly the same. 6.99 per container. Can raise redworms in box system, eat all food scraps and lots of good compost. I am going to capture bugs this year for freezing, then will add to suet for winter protein. I share suet with Hens thru out winter. I also read about cat food during molt. New girl appreciated. I have been raising mealworms for several years now. I have them in an uncovered 10 gallon tank. I placed around 3 inches of oatmeal in the bottom and added the mealworms. Sometimes I throw an apple core, piece of potato, carrot or green bean in for them to eat as well. I live in Florida so keep them indoors or in the garage so that they are not out in the elements – extreme heat or rain. They do not smell, make noise or escape. This has been an extremely easy way to raise a live protein source for my girls. I do still have to sift through the oatmeal to extract the worms by hand, but that is easy enough. There have been times that there are mostly beatles and very few worms, but after several weeks the cycle starts again. Once you get to the point that most of the oatmeal is powder you can take out a good number of beatles and worms, start a new batch and use the powder in a composter or as fertilizer. If you give the girls access they will eat any of the mealworms and beatles that you haven’t removed. I could do earthworms but I will not even try raising bugs.I would do store bought ones and keep in the shed. haha. i have never given my hens mealworms, but would love to see if they get as excited about them as everyone elses seem to. if so, then maybe i would try to grow my own. I want to raise my own mealworms, but I am a little grossed out by them. I do give my hens dried mealworms from Happy Hens treats! Oops, my email is shetan83 at yahoo dot com. Just “grub food for thought:” We live on a farm that had been vacant for three years and is surrounded by forest and open pasture for cattle. As a result, pesticide use on the land had been minimal and we are “blessed” with a healthy supply of grubs. I think most of them are pupae of Japanese Beatles. Depending on weather and how much time has passed, our back patio will be populated with 10 to 50 grubs just rolling around, making it easy for me to scoop them up with a spatula into a bucket, and then toss them to the chickens. The chickens will also dig them up on their own in the lawn. Another treat-harvest hot spot is underneath our compost tumbler. Whenever I am gardening, I will dig up a few worms and toss them into the tumbler, where they live, eat and reproduce even more worms. Some of them will wriggle their way out through ventilation holes at the bottom and the chickens now know that it is the first place to check on when they are let out in the morning. I was just reading on the linked website “Raising Mealworms” and it stated that oo many adult beetles in a colony may eat the eggs and larvae. If you still do not have any “worms” in your colony, you may want to seperate the beetles out. My birds love these i tried raising them not for me. I get mealworms from Tractor Supply–the bigger containers are a lot cheaper than the bags, and seven of my eight hens LOVE them. The eighth one, well, she’s not normal, anyway! Lol. I don’t think I’d be up to raising them, but it is interesting seeing them all grown up. I wondered if they were just worms, or larvae of some beetle/moth/whatever! Ugh, I can’t do it. I’m all about natural food sources but my chicks had better forrage for their bugs. No way could I keep a tankfull of beetles in my bedroom! You, my dear, are made of stronger stuff than I.
I enjoy watching the blue birds feeding meal worms to their babies. I like to feed the dried ones. I will definately try this at home. After years of digging up night crawlers, looking for any grub in the yard, catching grasshoppers ( not as easy as it was when I was 8) uncovering crickets, and just about any other bug considered good catfish bait, this should be a piece of cake. Thanks for all the good ideas here. Bonus learning moment! I came for the mealworm info (which is great, thank you) and also ended up learning what I was doing wrong with our worm composting attempt. We got the layered box system and the worms, shredded paper and started composting. After a few months we gave up because the little flies were taking over! So gross. So now I know that raising mealworms is possible (if not a lengthy endeavor), and that fruit and high moisture content scraps in our indoor worm compost is a no-no. THANK YOU! I raise mealworms in a three drawer Sterlite container that’s about 2 1/2 feet tall and three feet wide. I don’t sort the beetles from the pupae or the worms and everybody does fine. They seem to eat the dead beetles so that takes care of itself. There are about 1000 of mixed stages in each drawer. They are in 2-3 inches of wheat bran that I buy from the bulk grocery store. I put pieces of egg carton in to lay carrots, pieces of potato or whatever on for moisture. The beetles like to stay under the egg carton up inside. They are considered darkling beetles which means they prefer darkness. They live on my back covered patio year round, however, in winter I put heating pads in the drawers. If you live a frigid part of the country, you could put them in a garage or utility area with the heating pads. You can buy the heating pads at a pet store that carries items for reptiles. Even your Petsm**t type stores carry them. Regular heating pads for humans have automatic turn offs so they won’t work. The reptile heating pads seem expensive but I was buying mealworms weekly for my girls at $10-15 a pop. They pay for themselves in spades the first winter you use them. The worms do procreate much better in heat. When I give them to my girls, I scoop them up with hand shovel or plastic scoop from the dollar store. The wheat bran doesn’t hurt the chickens. I don’t give them the beetles because I read somewhere that a beetle carcass is too tough for chickens to digest but I don’t know for sure. Additionally, I try not to give them pupae simply because I want the pupae to become beetles and lay more eggs. Initially, you need patience and I started the three drawers at different times so I have some of every stage in all three boxes. I plan on adding another three drawer container this year. It’s really worth it. I still don’t like touching any of them but I don’t have to the way I raise them. I too want to start and had wondered how long? the worm to worm cycle would take. it would be great to take the once a year “Empty” to the compost pile and see if the summer heat could reproduce bunches for the chicks to free range on.. thanks every one for the ideas.. So how do you get them sorted when you scoop up out of the drawer? It seems like you would get a lot of each phase in each scoop, and there is NO WAY I’m going to touch them to pull out the beetles or pick out the beetles still in the box. another question – how many chickens do you have and how often do you get enough worms to feed to the chickens? SOrry I haven’t been on in a few days as we are moving! Oh joy! But we are moving to the mountains so I am super happy about that and I’m sure my girls will be, too. I believe my initial start up to get more worms to feed my girls was about 3 months but once the cycle gets going you will always have worms. But if they are outside they have to be protected from the elements and in winter, they need heating pads. Wendy, usually the beetles are on or under the egg carton and the worms tend to congregate usually in the front corners of the drawer they in. I can’t speak for everyone, but my system works for me. I don’t like touching them so I wear gloves. I usually take a big scoop and then push the few beetles I pick up back in the drawer and pupae if they happen to be in with the worms. I only have three chickens but I I have a boat load of worms with just a three drawer sterilite container. The key is to start with 1000 or more worms per drawer and the start the drawers 3-4 apart. Once the cycle gets going there are plenty of worms. Obviously, if you have a bigger flock then you may need more drawers/containers of worms. I used the sterilite 3 drawer container because they are shallow but wide. The beetles DO NOT fly and they can’t climb the slick plastic. Many people use old 10 gallon fish tanks. If you don’t have any you can pick them up at yard sales and flea markets really cheap. Please feel free to email me with more questions at nativefloridagirl@yahoo.com with mealworms in the subject. I will try my best to help! I have a rather small set up. I purchased 500 live mealworms through an on-line seller. I put them in with whole wheat meal in a plastic shoe box with no cover at all. I keep this in my bedroom closet on the floor. I have the wheat at one end of the shoebox and slices of potato or zucchini at the other end. When the first batch turned to beetles, I started another shoebox for them. It is set up the same way with the wheat and vegetables. I just add fresh wheat on top of the shoebox with the beetles so I don’t throw away eggs or little worms. As the worms in the other shoebox start to change, I take out the pupas (or the worms seem to snack on them) and I put them in with the beetles who seem to leave them alone. When I have either used all the worms in the one bin or have transfered them to the beetle box, I dump all the wheat and wash out the shoe box and use that box as my new beetle box. I occassionally use a small sieve to get the worms out of the wheat so I can put all new fresh in. I have had about three new generations of worms since I began and now end up with thousands with each new generation. nativedoctor101@live.com MERUJA OWO… SCAM ARTIST,,,BEWARE,,, USER Doris( post on this forum) is a scam artist who advertises for this nigerian scam artist NATIVEDOCTOR101@LIVE.COM…. Meruja took me for 650$ canadian dollars. HE IS A SCAM ARTIST FROM NIGERIA. MERUJA OWO will ask you to send him money western union and than he will haggle you for more and more money and he is fake with no results. HE IS A SCAM BEWARE,, HE IS BEING INVESTIGATED FOR FRAUD AND WILL BE GOING TO JAIL. DO NOT USE THIS MAN BC HE WILL STEAL YOU MONEY! I just can’t bring myself to try raising them. I was hesitant to even get chickens because it’s more critters to take care of. WOW! I did not know you could raise these– but WHY NOT? Thanks for letting us ‘in’ to ‘your world’….. It gives us all such great INSPIRATION! Thanks, Mini, Tinker-bell, Maxi, Snow Flake, Chubby, Anna Mae. Thought I’d chime in! I’m raising mealworms in my computer room where the pellet stove resides. I also have red wigglers in the cellar. I’m fine with the worms. Hell, I dug those out of a huge aged manure pile myself. 🙂 I wasn’t sure if I could handle the beetle phase of mealworms but I’m doing okay. My cat is fascinated by these things in the rubbermaid tub. I am looking forward to getting them out to the garage for the summer. Wish I could fit them in the coop! 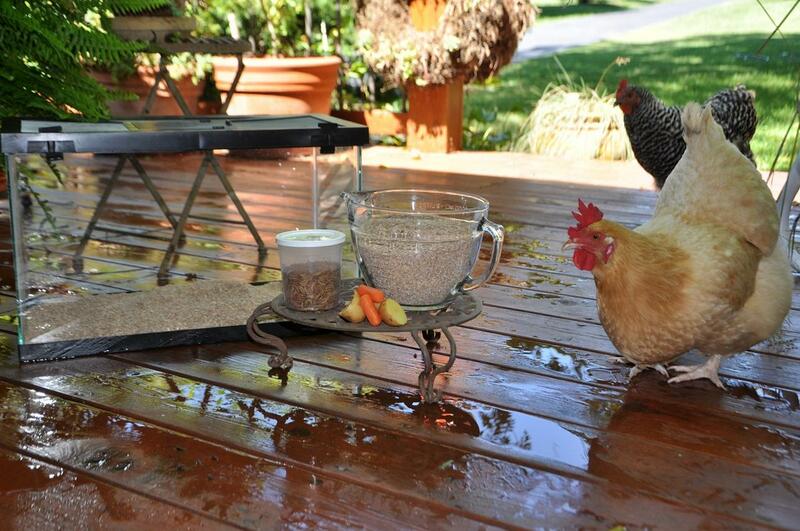 My hens LOVE Happy Hens mealworms!!!! I like to hand-feed my favorites to make the treating last longer. Would love to try this but I have allergy induced asthma and can’t take the chance. I have to buy my mealworms. I try to buy my chickens and bluebirds the Happy Hens Treats. Yes, they are expensive but will have to do until I can raise some of my own. The birds LOVE them. My worst problem is squirrels and other birds raid my blue bird feeder that I try to put up just for them. I just saw around 10 males in my yard last week…I have one house that they come back to EVERY year…yeah!!! Thanks for the great idea !! I never knew I could raise my own mealworms. Our hens go crazy over meal worm. Thanks for the opportunity to win a bucket of them!……they are a little spendy. I found that my compost heap was creating mealworms so now & then I’d take a shovel full and throw over the fence for the chickens’ delight. However after I started letting them freerange every afternoon, they found the compost heap and now they help themselves to whatever they find in there. Very interesting, I will definitely have to consider this. I spend about $10 every time I buy a container of meal worms and it would be nice to be able to produce my own. I’ve tried it more work than worms,especially when feeding large amounts.